After flirting with Chicago for the last few weeks, summer has finally committed and made itself at home, putting its feet up on the couch, drinking milk from the carton, and wringing out his sweaty gym shirt before tossing it on the floor. Yes, the summer we have all been waiting for is here and it is HOT and humid! Fortunately, our apricot tree has continued to pelt us with its sugary ammo and so we have been forced to produce more treats. 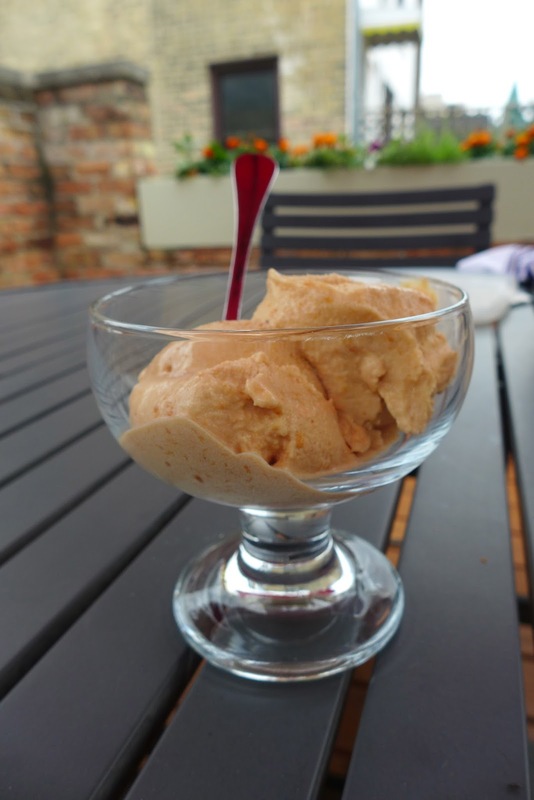 Along with the steady production of jams that occupy a chunk of my mother's time each day, I tried my hand at making apricot ice cream to cool off in this weather. We dusted off the ice cream maker, peeled about 750 grams of 'cots and pulsed them, heated milk and cream with a vanilla pod and sugar, mixed everything together, cooled it, churned it, and... voila! It was a satisfying way to bring the temperature down a few degrees. As the 'cots continue to fall, I wonder- what we will make next?